Reports From The Pharm: Just my 2 cents....(multiplied by 36) = 72 cents! Happy Stamp Day to you! Happy Stamp Day, dear Admissions Office! 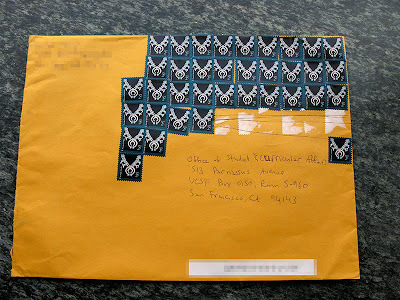 Thirty-six 2¢ stamps on a mailing! Thirty-five 2¢ stamps on the mailing! I wish I made this stuff up. Unfortunately, I'm serious. I'm "for reals"!